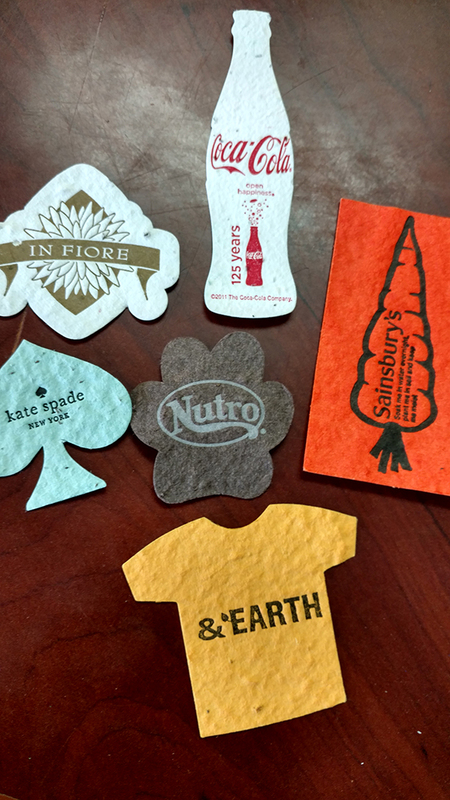 Part two of our specialty papers roundtable on seed paper and handmade paper focuses in on more excellent tips and inspiring projects from three amazing printers and paper vendors. And don’t forget to check out Part 1 here for tips and tricks for getting the best print on luxurious deckled paper and the eco-friendly! Don Martin – Bloomin Paper Keep ink coverage to a minimum [when printing on seed paper], as any place that the plate strikes, it will crush the seeds and they won’t grow. Additionally, the cracked seeds ooze an oil and stain the paper, so light minimal ink coverage is always best. Our paper are thick and packed with seeds, so even if some of the seeds are damaged by the letterpress printing, the paper will still grow. It’s not an exact science [when printing on specialty paper]. Folks should know that variations in the paper thickness can cause the printing density to vary as well. Again, minimal ink coverage minimizes that concern, as heavy solids are more noticeable. 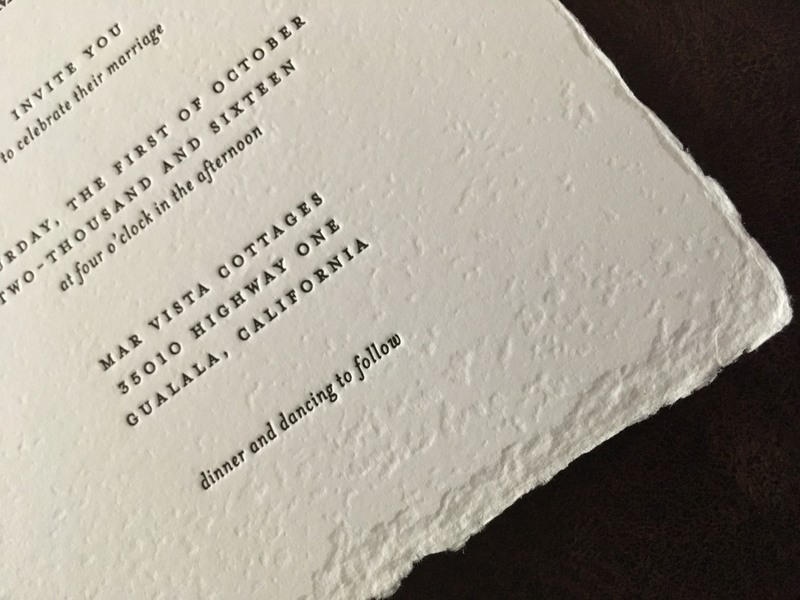 Bloomin’ Premium papers are thick enough for any letterpress plate to get their teeth into it. 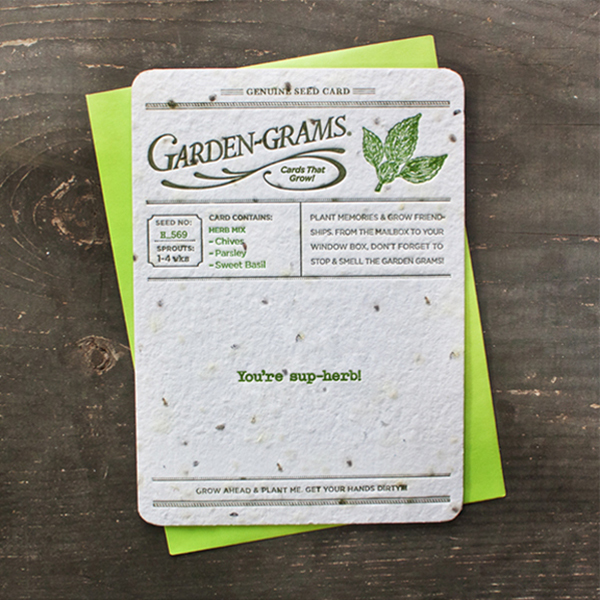 Because this Premium seed paper sheet from Bloomin is packed with seeds, it grows great, even when a percentage of the seeds are damaged on press. The variation and handmade quality of the Bloomin papers makes each and every final piece unique and original. 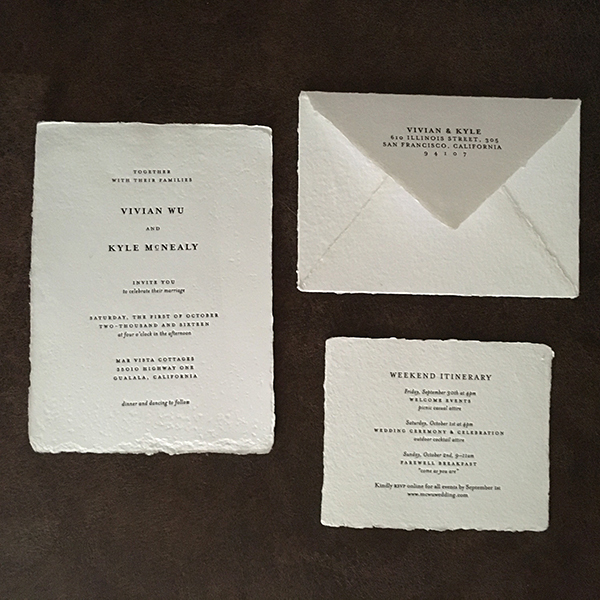 Handmade paper letterpress printed one-at-a-time has an old world nostalgic quality that no digital or offset machine can replicate. Jenn Upham – Tiny Pine Press For printing on handmade paper: If you have a natural deckle, it’s important to go slow, because sometimes the sheets don’t drop into the gauge pins on their own and you usually don’t have too much overage. I always set up on trimmed edge paper as make ready because the edges can get so wiggly. Also, you have to make sure the type is extremely clean to get a crisp pillow. For seeded paper: You really have to watch your type because if a seed hits it could drop out and be there for a while because it mashed in the packing – so I move around the packing to make sure nothing too bumpy gets in my way! I use Of the Earth for their lotka seeded … it’s not too seedy but still nice. Greenfield Paper Company has so many colors of seeded. I love Jute from Sustain and Heal, these are all trimmed edge. I hold my natural deckle vendors closely, but unfortunately some of those have gone out of business so I can’t even refer them. I love the pillow of both. Most handmade or seeded papers are not processed as much and they are extra soft. The type sinks in and you just want to grab a blanket and rest your head on a wedding invitation. Annemarie Munn – Lady Bones Paper Inc. The main challenge of printing on handmade paper is that both the thickness and density of the paper can vary enormously within a single sheet as well as between sheets, which poses a problem both for achieving consistent impression and consistent transfer of ink. There’s a bit of letting go that’s necessary for the especially exacting printmaker; the printed pieces will be neither as close to identical, nor as easy to control, as those printed on commercial paper. In order to get the cleanest prints I can on handmade paper, I generally use fairly hard packing, set my rollers as high as I can get away with, and use slightly more ink than I normally would. I use a heavy impression, so that the thinner sheets (or parts of sheets) will still get a decent hit. I also just try to relax and let the process happen! Another issue with handmade paper is the deckle. It doesn’t come up every time (some projects will have a clean cut edge), but often the natural deckle edge is a desirable component of the handmade sheet (especially in the wedding industry, currently). The deckle presents a problem for registration of course; tight register is not possible when printing on paper with a deckled feed-edge–if you need to achieve a tight register, it will be necessary to cut the feed edges square and then create a false deckle by tearing–but it’s far preferable to just avoid printing tightly registered pieces on deckle-edge paper, and instead use a simple one-color design that allows the paper to be the star. A deckled feed edge can also sometimes cause the print to appear crooked on the overall sheet (though it is straight to the feed edge)–this crookedness drives me bonkers, so I usually tape a gridded sheet to my feed table (on the Vandercook) so that I can achieve a feeling of overall straightness even when none of the paper’s edges are actually straight. That might sound a little over-the-top… but letterpress printing nearly always is, right? I like a lot of handmade paper vendors; there’s something to appreciate about any handmade sheet. That being said, my all-time favorite handmade/seed paper is from Porridge Papers. I really enjoy the proletarian aesthetic of their Blue Collar line, and I love buying from small, authentic companies. I have a hard time talking wedding clients into using the Blue Collar Papers, both because of the cost and because they don’t fit the in vogue, airy, natural-deckle aesthetic as well as a paper like Silk and Willow, so I mostly covet them for personal projects, and wait around for the special client who will get on board with the workman aesthetic! 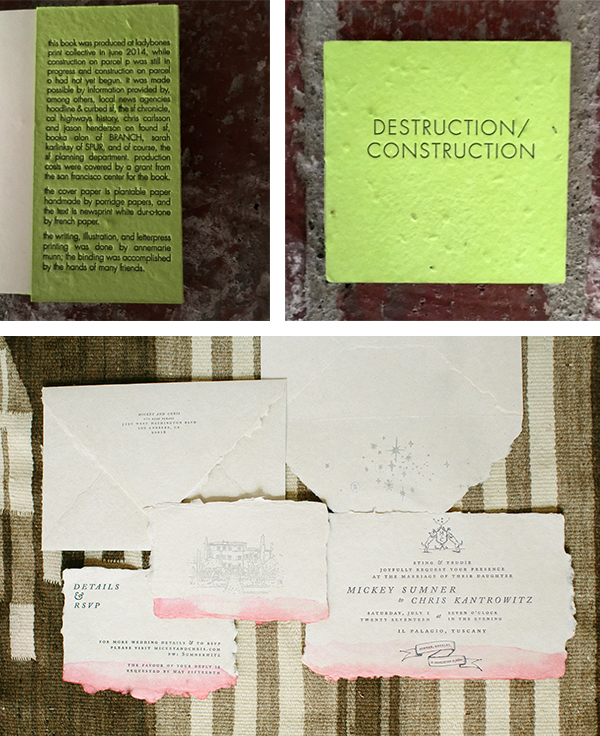 The cover of Deconstruction/Construction, the book I wrote and printed for the San Francisco Center for the Book’s Small Plates series, was printed on a Porridge Papers seed paper. The color is sadly discontinued–it’s a fantastic neon green which I believe was called Sour Apple. I have some sheets left and I’m always mulling over what to print on them; so far, I’ve just been hoarding them away. 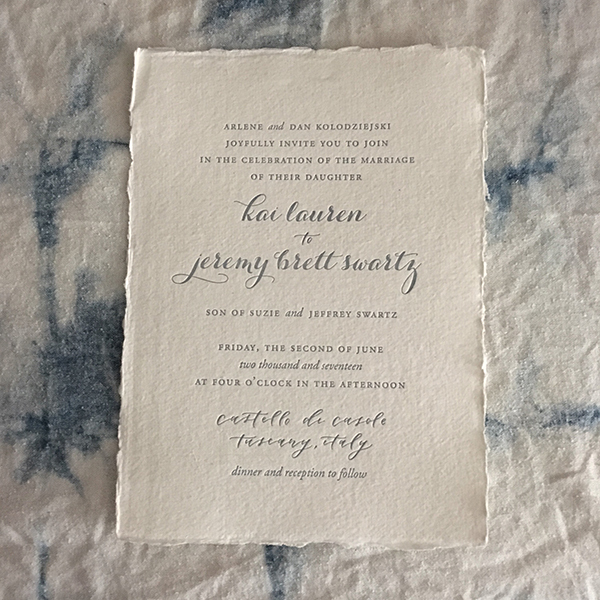 I also love printing on hand-dyed or dipped handmade paper — the colors never land in exactly the same place on each sheet, so when designing for hand-dyed paper I enjoy contending with that element of chance, and while printing, it’s just a visual feast. 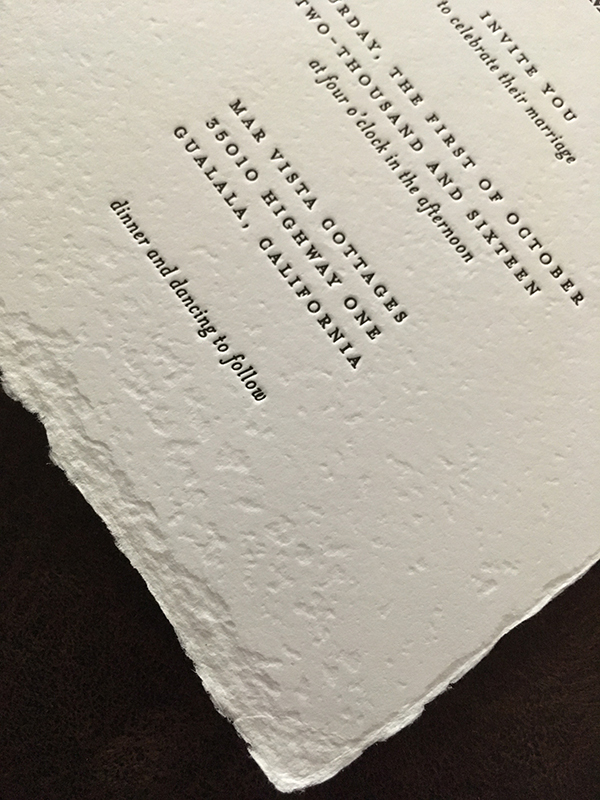 Seed paper is a special challenge because the seeds can be hard enough to dent the printing form. For this reason, I only print on seed paper with polymer plates–I don’t want to damage my lead or wood type! Incidentally, on the other end of the papercost spectrum, chipboard poses the same problem, because it can have small pebbles or pieces of debris in it that will dent type (I learned this one the hard way!). Sometimes the seeds can even dent the super-hard polymer, but luckily that can be re-made when necessary, so it’s not as serious of an issue. Fun side story: My first commercial venture as a printer, at the age of 11, was hand-printing my linoleum cuts onto handmade paper to make Christmas cards. I made the pulp out of scrap paper and dryer lint in an old blender; my dad was kind enough to make me a screen and deckle out of some 1″ x 1″s and an old window screen. The decision to make the paper myself was a classic misguided money-saving move, I just didn’t want to pay for paper, so naturally I opted to spend days making my own instead. I think I charged a dollar a card. Still feeling as energized as we are? Share your thoughts & tips in the comments section below–we’d love to hear from you!